HALF MOON BAY, Calif. -- A paddleboarder in Half Moon Bay in California got up close and personal with a whale this weekend and even captured it on video, CBS San Francisco reported. 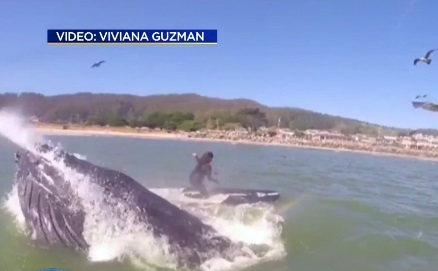 The humpback whale leaped out of the water right next to Viviana Guzman, bumping her board. Guzman said she was startled -- that's for sure -- but somehow managed to keep her wits and stay on her board. Her friend had another camera rolling and managed to catch the close encounter from another angle.